Scottish-director Mike Day’s debut documentary feature, The Islands and the Whales will receive its World Premiere at Hot Docs Canadian International Documentary Festival in Toronto on Friday 29 April. A delegation of eight Scottish documentary makers will also travel to the festival to showcase their work and engage with the international screen sector. The documentary, based on the hunting culture in the Faroe Islands and our effect on the environment, was filmed over four years and resulted in the creation of a new sound recording technique. 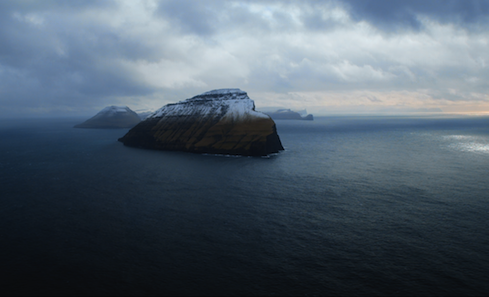 The Islands and the Whales is the first film to use ambisonic sound recordings at source and recreate them in cinemas in Dolby Atmos, a system using 128 speakers including vertical channels. This means that cinema audiences will experience the sound as it was in the field surrounded by the documented soundscape. The premiere will include a showcase in association with Dolby and Skywalker Sound to demonstrate the success of this new technology and technique, made in Scotland. The Scottish delegation led by the Scottish Documentary Institute includes eight independent documentary filmmakers; Anthony Baxter (Director/Producer - Montrose Pictures), Felipe Bustos Sierra (Director/Producer - Debaser Filums), Adam Dawtrey (Producer - Bofa Productions), Robbie Fraser (Producer - Pure Magic Films), Nick Higgins (Producer - Lansdowne Productions), Marie Liden (Director - Freelance), Gill Parry (Producer - Connect Film), Aimara Reques (Producer - Aconite Productions). Leslie Finlay, Screen Officer, Creative Scotland said: “Scotland has a great history of producing pioneering documentary makers from Grierson to Mark Cousins and Kevin Macdonald. Like these famous names Mike Day has pushed the boundaries of documentary making with The Islands and the Whales and it is only fitting that the film is screened at Hot Docs, one of the biggest documentary festivals in the world. Hot Docs Canadian International Documentary Festival is North America’s largest documentary festival, conference and market. Each year, the Festival presents a selection of approximately 200 cutting-edge documentaries from around the world. Synopsis: In their remote home in the North Atlantic the Faroe Islanders have always eaten what nature could provide, proud to put local food on the table. The land yields little, so they have always relied on harvesting their seas. Technical: Mike Day worked with George Lucas’ Skywalker Sound to pioneer this, with Dolby to promote it, and with Harpex who have developed software especially for this film to translate the ambisonic recordings from a specially designed tetrahedral mic, to Dolby Atmos. Creative Scotland funding: £70,600 National Lottery funding through Creative Scotland’s Targeted Screen Fund. Mike Day is a Scottish director and cinematographer. Formerly a lawyer, his debut film The Guga Hunters of Ness screened on the BBC in 2011 and at festivals internationally. Mike founded Intrepid Cinema in 2009 before heading out into the North Atlantic to document the last ten seabird hunters permitted to continue a traditional gannet hunt in the Scottish Outer Hebrides. This was the first time since 1959 that the hunters had allowed this once secretive tradition to be filmed. After two weeks at sea they returned home with a rare glimpse into this vanishing world.